Lafite 2000: A relatively early growing season with above average temperatures and normal rainfall. Precipitation at the end of May and early June made the vines subject to mildew, but our technicians were diligent in protecting the grapevines. The end of summer was beautiful, and the dry hot weeks in August and September gave very ripe grapes. Very dark colour with hints of purple. The aromas are sumptuous and captivating, both powerful and extremely delicate on the palate, with remarkable tannic structure and length. There are two clear conclusions which may be drawn from the review which follows: there have been a wide range of values paid for this wine and that its value has increased considerably since its release. 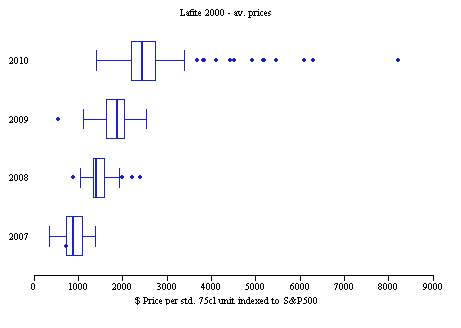 Thus, the distribution of auction prices is asymmetric. Further analysis shows that there is a simple explanation for most of the behaviour demonstrated above. Hong Kong has only recently entered the market for sales for this wine and it is the prices achieved there, with associated extreme price values, that are the major influence in the behaviour of the data when considered as a whole. Hong Kong has also been the venue for a major sale of wines coming direct from the Château which has further impacted values. However there are also other significant conclusions which one might draw about this wine and highlight further areas of exploration. These have a material impact on investment/divestment decisions. i. Contrary to expectations little or no premium appears to be attached to wines bottled in larger formats. Jeroboams are cheaper than all other wines. Imperials show a slightly higher value. ii. Complete cases of wine sell for higher prices than part-case lots. However this is not true across all quantities. Single bottles and even 3-case lots hold their value. iii. 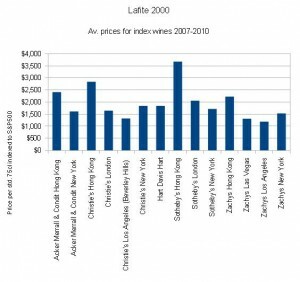 Values of the wine are highest in Hong Kong. However, values in Chicago (Hart Davis Hart) are higher than any values outside of Hong Kong. iv. 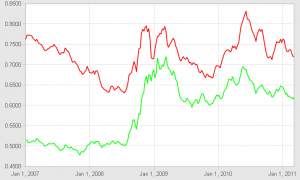 Generally speaking, the wine has increased in value each year and performed better than the S&P500 index. v. Further seasonal analysis may demonstrate some optimum times to buy/sell. Those wishing to maximise their return would attempt to sell in the Far East perhaps in the last quarter of the year. Full cases are optimum but some split cases can achieve an equivalent value. Cheaper values were obtained in California or Nevada. However, clearly, provenance always underwrites the wine's long term value. 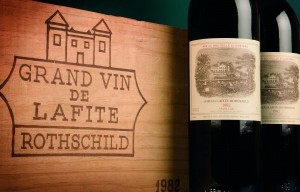 Lafite Rothschild 2000 is one of the wines which make up our FineWineAuctionIndex50. During the period under review the FWAI50 rose more than 60%. We looked at auction data for this wine for the period 2007 – 2010 – a total of 656 auction records (after taking out lots which went unsold). We selected this relatively short period because of the influence in the market of a new consumer of this wine in the Far East which, as we will see, has had a major impact on the market and prices such that comparisons with earlier data are rendered redundant. Bottles of this wine can be purchased in all the major auction centres in a variety of bottle formats. This study looked at the values obtained and attempts to establish what factors may affect the prices paid. The release price for Lafite 2000 was $220/75cl in Spring, 2001 or $2,640/12 bottle (75cl) case. This is an extract from our FineWineIndex DB report (below) which shows the gains on this wine since its release in 2001. The gains are significant showing simple annual percentage increases of 115%, with a total realisable gain of 1,150%. The case value has increased from $2,640 to $33,000, a profit of some $30,360. The profit/loss on exchange ($ into £) has been negligible by virtue of the enormous upside in the case value. 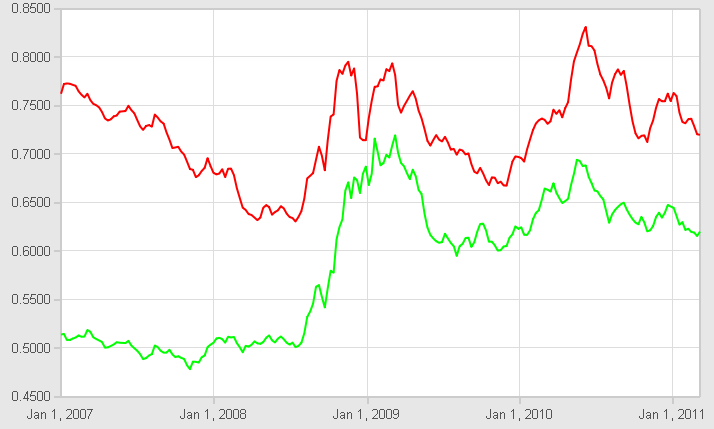 The difference in the rate of exchange between the $ and £ was an 11.9% decrease in the value of the $ over this period (April, 2001 – March 2011). 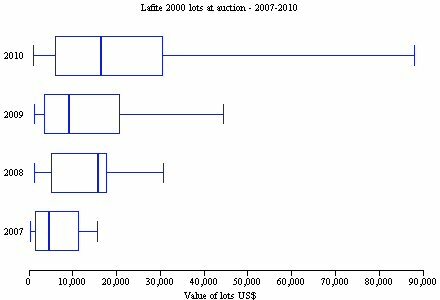 The total of standard bottle sales in the period 2007 – 2010 was equivalent to 6,513 bottles in standard 75cl format worth $11,477,677 at December, 2010 prices (this cost is lower than the historical un-indexed cost). 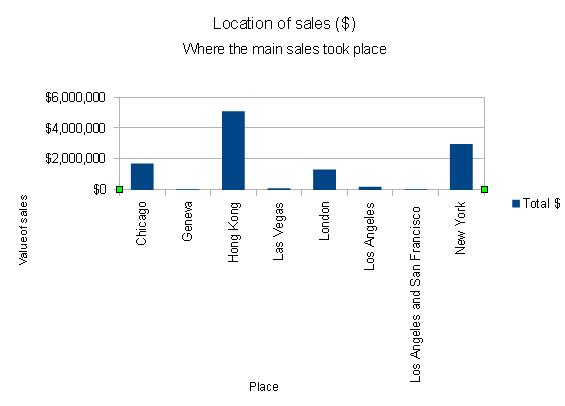 Sales were located in Chicago, Hong Kong, London, New York, Las Vegas, Los Angeles and San Francisco. 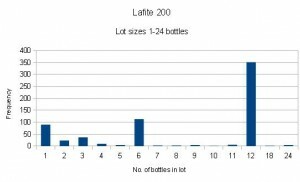 The distribution of the size of the bottles of wine sold shows that the majority are in the standard unit i.e. 75cl bottles. There are 656 records for auction sales of Lafite wine in the database. The lowest price paid for a bottle equivalent was $334, the highest $8,201. 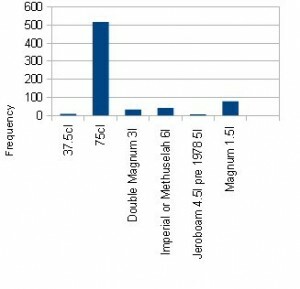 A bar chart of the distribution shows a markedly skewed distribution. This means that for any tests of significance it would be preferable to use the median values rather than the means. The mean values would be influenced by the clearly visible extreme (high) values and the median value excludes the 'outliers' from calculations of the mean. 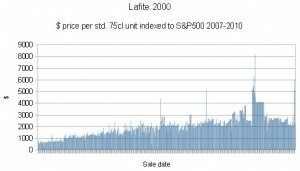 The median price paid for a standardised bottle of Lafite Rothschild 2000 is $2,050 with an interquartile range of $1,140. 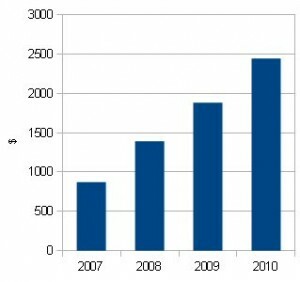 The graph shows the distribution of the prices in US$ paid for each lot in each of the years 2007 – 2010. 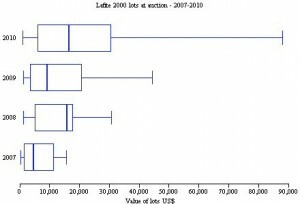 Lot values increased every year except for 2009. The graph below shows that the median price per bottle increased in every year of sale despite the prices being indexed to the S&P500. There has been therefore a consistent and real increase in prices year on year. 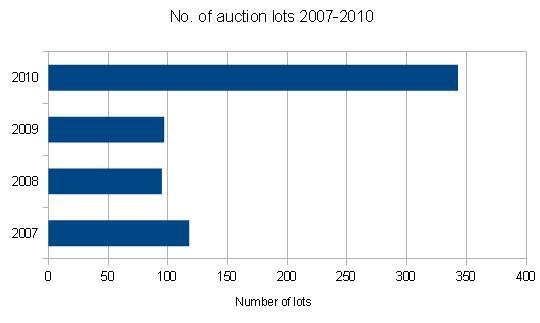 The volume of sales as measured in auction sales (lots sold) has generally increased over the years with a dip in 2008 and 2009. 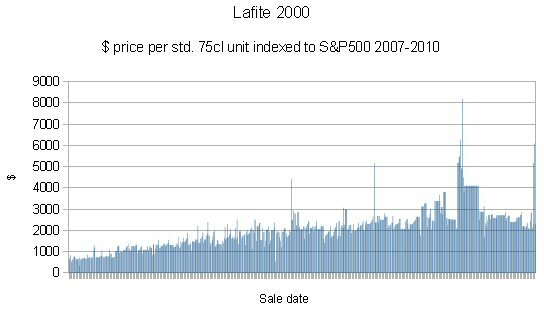 However, it is very clear that activity in sales of Lafite Rothschild 2000 was significantly higher in 2010 than previously. Although the highest price was evident in the last quarter (Qtr 4 – Oct/Nov/Dec), the median value is not much higher than in the second quarter. 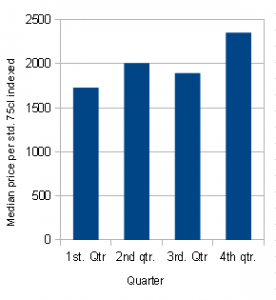 However, a greater number of sales in 4th quarter, particularly in 2010, have dragged the median up. 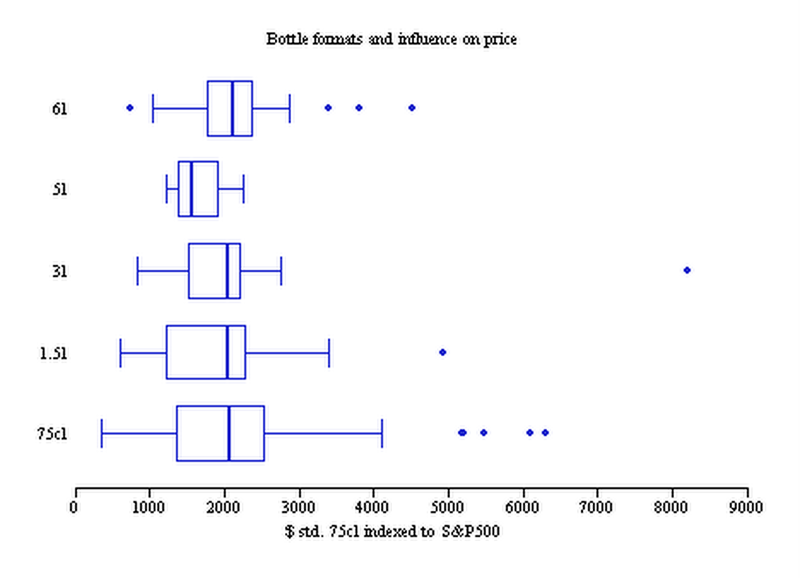 The graph shows the distribution of prices for wine sold in different sized bottles. This shows that there is very little correlation with format despite the Imperial format showing a slightly higher value. For example, the lower price for the smallest bottle (37.5cl) coincides with the very low sales of bottles of that size and so perhaps only of marginal interest. Only the larger Imperial size shows any additional value over the normal auction lot of 75cl bottles with a higher median value of some 3%. 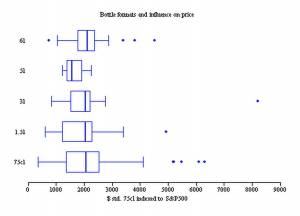 Inexplicably, jeroboams show one of the lowest median values (coupled with a low offer quantity). The graph shows the number of lots sold for each bottle size. 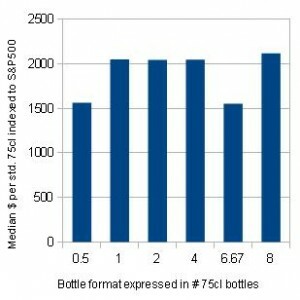 Looking at the median values one can see that some loss would likely be made in selling lots of 4, 5, 11 and 24 bottles. 10 bottle lots were excluded as they occurred very infrequently. Do the prices reached for wine vary according to the location of sale? Clearly the Hong Kong values are significantly higher than those achieved elsewhere. 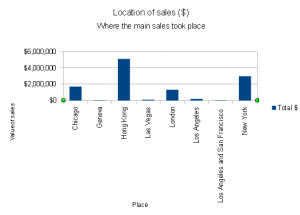 It is also self evident that the prices paid there had a skewed distribution compared to those in the other locations. 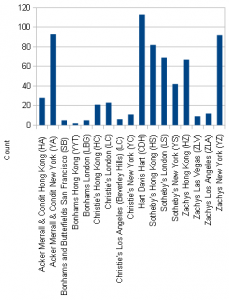 The Hong Kong distribution demonstrates the existence of a significant number of extreme high values. 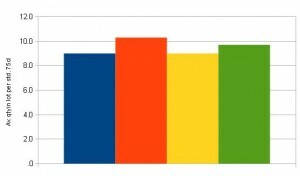 It might be instructive to examine the number of sales in each of the main centres over the last 4 years. The graph shows the mean prices achieved at each of the auction houses. 1 Sotheby's Hong Kong – top seller of this wine in Hong Kong. 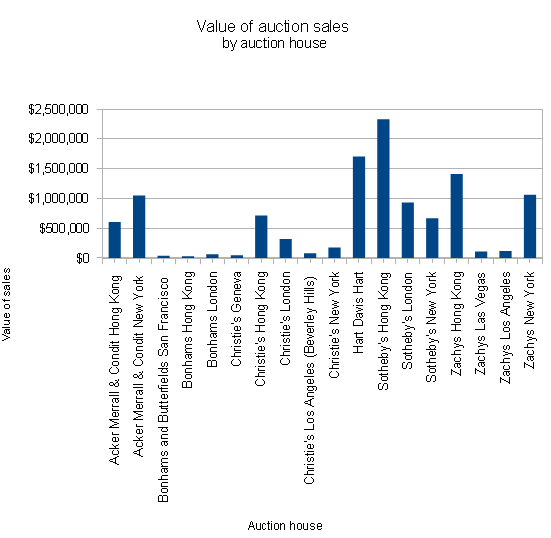 This shows the clear geographical links but some auction houses do appear to draw better prices than others. 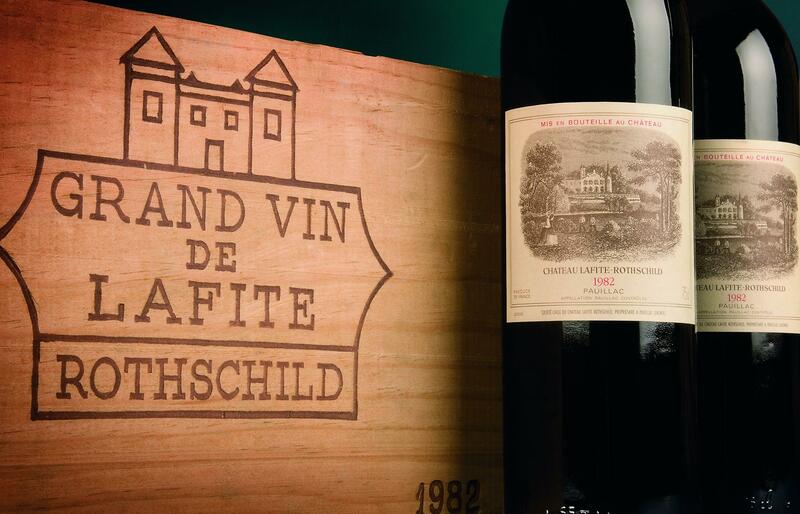 There is no immediate link to the higher values obtained and the volume of sales of this wine by the various auction houses notwithstanding that Lafite 2000 is only one of many wines which an auction house may offer. In fact, as at the end of 2010 Acker Merrall & Condit had sold more wine in Hong Kong than any other auction house. 9 Acker Merrall & Condit Hong Kong - 3rd in auction prices (Lafite 2000) – but, incidentally, sold more wine than any other auction house in Hong Kong in 2010. Selecting the auction house where you buy or sell could be important. 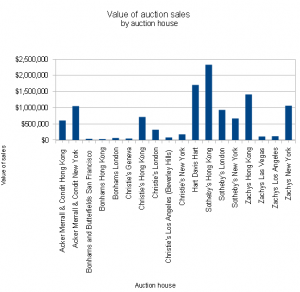 We have used data from the major auction houses – Sotheby's, Christie's, Zachys, Acker Merrall & Condit and Hart Davis Hart. We have included all sizes of lot (e.g. whether the lot contained 12 bottles or just one), and all formats reducing the values to a standard 75cl format. 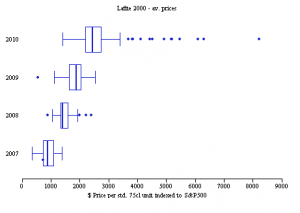 We have also indexed the wine prices to to bring them into line with the movement of the S&P500 Index using as our base the value of the Index at 18 December, 2010. 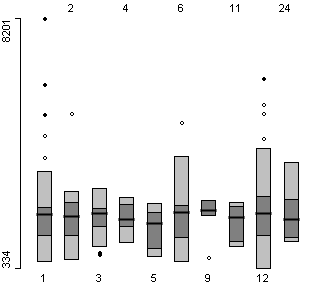 We have subsequently used this distribution to investigate its relationships with other variables. Our FineWine database was used for this exercise which includes auction results from the major auctions houses and converts currencies on the date of auction going back to 2000. All entries are reduced to a standard bottle size of 75cl. Mixed lots and verticals are generally excluded. Bottle format – this can range from 37.5cl to Melchior 18l.